Preheat oven to 180ºC (350ºF). Heat the oil in a large, heavy-based saucepan with an ovenproof handle over high heat. Sprinkle the shanks with salt and pepper and cook for 1–2 minutes each side or until browned. Remove from pan and set aside. Add the onion, garlic and bay leaf and cook for 2–3 minutes or until onion has softened. Add the wine and cook for 1 minute. Add the stock and tomato paste, and return the shanks to the pan. Cover with a tight-fitting lid, place in the oven and roast for 2 hours or until shanks are tender. While the shanks are cooking, make the Paris mash. Place the potatoes in a large saucepan of salted cold water and bring to the boil. Cook for 1 hour or until tender. Drain and set aside to cool slightly. Peel the potatoes and press through a sieve+. Place the butter and cream in a saucepan over high heat and stir until butter is melted and cream just comes to the boil. Add the butter mixture to the potato with the egg yolks and salt and mix well to combine. Set aside. Once cooked, allow shanks to cool completely. Remove from pan, reserving the pan juices, and shred the meat. Discard any fat. Return meat to the pan and mix to combine with the pan juices. 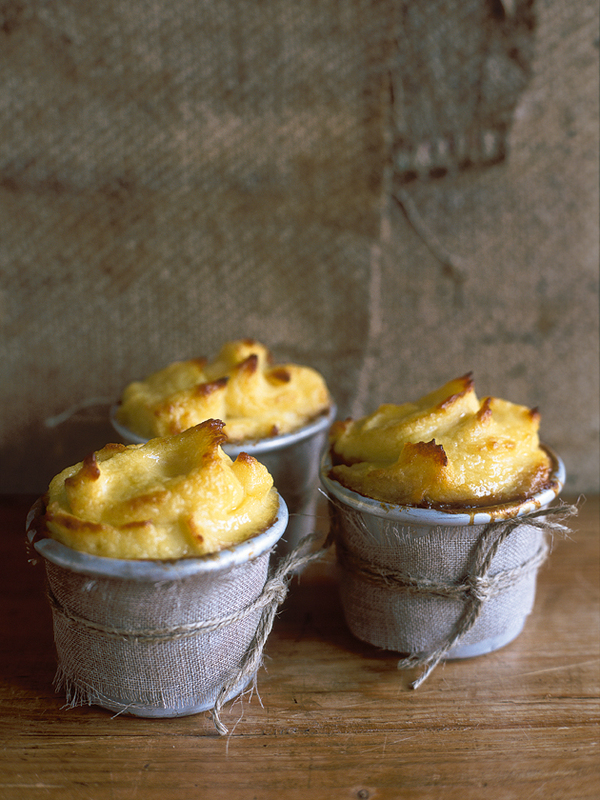 Spoon into 4 x 1 cup-capacity (250ml) pie tins, top with the Paris mash and bake for 10–15 minutes or until golden. Makes 4. + Pass the potatoes through a sieve, in batches, using a wooden spoon or rubber spatula to remove any lumps and to give a smooth and silken mash.